The last two weeks might be aptly named “The Time of the Trilogies.” Despite it being one of the busiest periods of the year for me at work, Abby and I shared both The Matrix movie trilogy and The Lord of the Rings movie trilogy. As if that wasn’t enough, last night I dug up our DVD of Avatar, which we watched last night. The seven movies seem to go together due to similarities in plot elements: one seemingly week or uncertain character is tasked with the salvation of entire civilizations; one outnumbered group summons the assistance of similar groups far away; epic battles are waged interwoven with subplots; and the way we perceive the scale of these battles is challenged by CGI manipulation. Basically, Jake Sully jacks into the Matrix to save Gondor. Readers might recall from a comment or two that, like most people, I like The Matrix far better than its sequels, the main reason for be being that the movie plants the seeds of doubt in our own minds about a possible alternate reality: are we part of the Matrix? The Lord of the Rings wasn’t as engrossing as I’d hoped; I’m glad we watched it, but we probably won’t see it again soon. Maybe in five years when we’ve forgotten some of the plot. 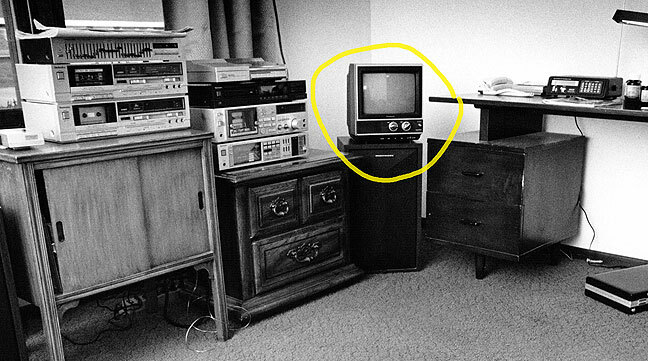 Circled in yellow in this 1988 image is my first television, an 11-inch Panasonic. Abby and I watch everything these days on a 50-inch plasma screen. The thing I like about Matrix 1 (relative to 2 and 3) is that it stands on its own, has a complete message. And yes, it challenges the assumption about reality. I still remember the way it felt when I first saw it — mind blown. Easily in my Top Ten of all time.